the jumble is a cookie born out of the butter and sugar saving days of world war II. it all began with the molasses jumble but then came the spiced molasses jumble, the lemon molasses jumble, the frosted molasses jumble, the coconut jumble, the raisin jumble and in 1955 the jubilee jumble. the jubilee jumble was created by general mills in observance of the 75th anniversary of gold medal flour. 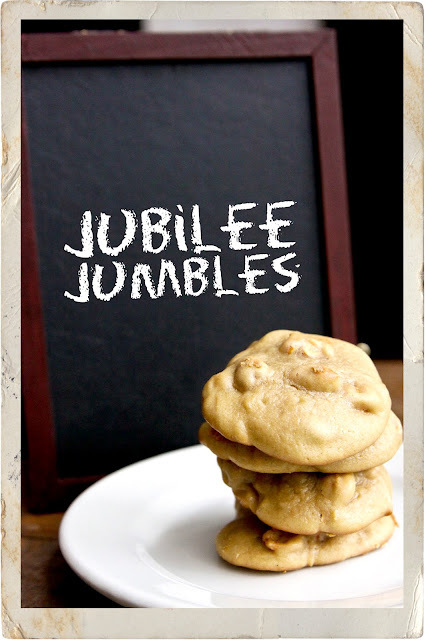 by 1955 there was no longer a need to ration sugar so jubilee jumbles are made with brown sugar instead of molasses. mix shortening, sugar and eggs thoroughly. stir in sour cream and vanilla. measure flour by dipping method or by sifting. stir together flour, soda and salt; blend in. mix in nuts. chill dough if soft. heat oven to 375 degrees. drop rounded tablespoons of dough about 2" apart on greased baking sheet. bake about 10 minutes or until almost no imprint remains when touched lightly. if desired, spread cooled cookies with a browned butter glaze. makes about 4 dozen cookies. these cookies have a soft, chewy texture and the nuts add a salty touch to the sweetness. not my favorite cookie from the cookbook so far but still a nice cookie to snack on!